Physically based rendering (PBR) is now common in game (See Adopting a physically based shading model to know more about it). When I introduce PBR in my company few years ago we were actually working on rain. 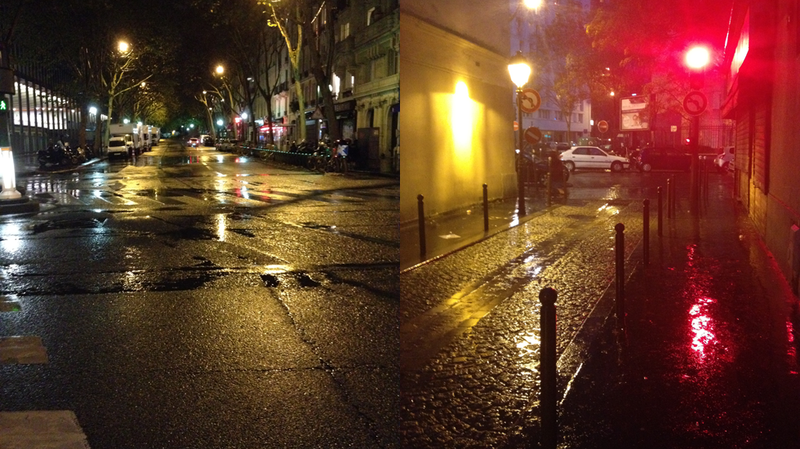 At this time we were questioning about how our new lighting model should behave to simulate wet surfaces. With classic game lighting model, the way everybody chose was to darken the diffuse term and boost the specular term (Here I refer to the classic specular use as RGB color to multiply with the lighting). The wet diffuse/specular factors being eye calibrate. I wanted to go further than simply adapt this behavior to PBR and this required to better understand the interaction between water and materials. This post is a mix of the result of old and recent researches. I chose to provide up to date information including experimental (not complete) work because the subject is complex and talking about it is useful. This might be of interest for future research. The post describe how water influence materials and provide ways to simulate wet surfaces with physically based lighting model. I suppose here that’s the reader know the basics of reflected/refracted lights with Snell’s law and index of refraction (IOR). This behavior is commonly observed for natural or human made rough material/porous materials (brick, clay, plaster, concrete, asphalt, wood, rust, cardboard, stone…), powdered materials (sand, dirt, soil…), absorbent materials (paper, cotton, fabrics…) or organic materials (fur, hair…). However this is not always the case, smooth materials (glass, marble, plastic, metal, painted surface, polished surface…) don’t change. For example, there is a big difference between a dry rough stone and a wet rough stone but a very small difference between highly polished wet stone and highly polished dry stone. In the following discussion, wet surfaces refer mostly to rough and diffuse materials quenched in water and having a very thin water layer on their surfaces. Why rough wet surfaces are darker when wet ? Because they reflect less light. There is two optical phenomena imply in this decrease of light reflection and they are details in  and . A rough material has small air gaps or pores which will be filling by water when wetting process begin. 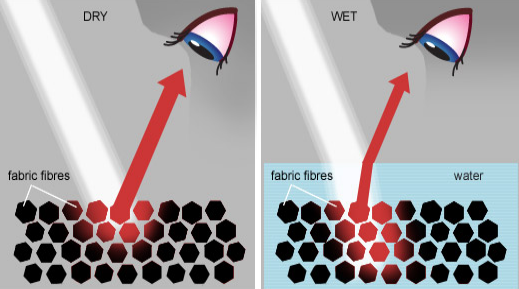 When pores are filled, there is “water saturation”, water propagates onto the material as a thin layer. This reflected light from the surface is then subject to another round of absorption by the surface before it is reflected again. This light’s back and forth result in darkening of the surface. Now take a look at the water filling in the pore inside the rough material. There is a concentration of water beneath the surface. The water which replace the air have an index of refraction higher than that of air (1.33 against 1.0) which is closer to index of refraction of most rough dielectric material (1.5). 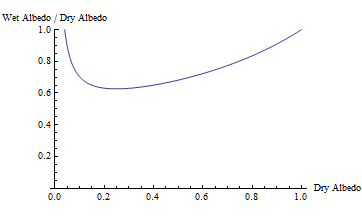 Consequence, following the Snell’s law, light entering in material will be less refracted due to the reduced index of refraction difference: The scattering of light under the surface is more directional in the forward direction. The increase scattering events before the light leave the surface increases the amount of light absorbed and thus reduce the light reflection. The darkening of the material is also accompanied by a subtle change in saturation and hue. 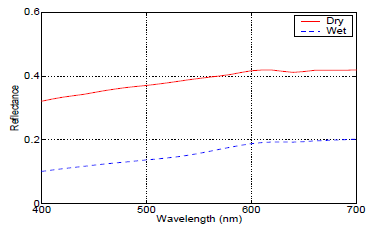 In  the spectral reflectance (i.e the “RGB” representation of real world color, the visible range of the spectrum is around 400nm blue to 780 nm red) of a dry and wet stone has been measured to highlight these characteristics. Analyze show that’s there is a significant reduction in reflectance across the whole range of the visible spectrum when the surface gets wet. Which confirm the darkening of the surface. 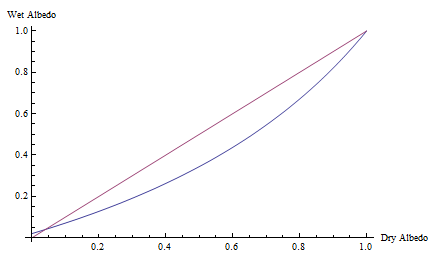 It also show that’s the surface color becomes more saturated because of this reduction. In several games today there are dynamic weather effects. The most popular weather effect is rain. Rain has sadly often no effect on the gameplay but it has on the visual. 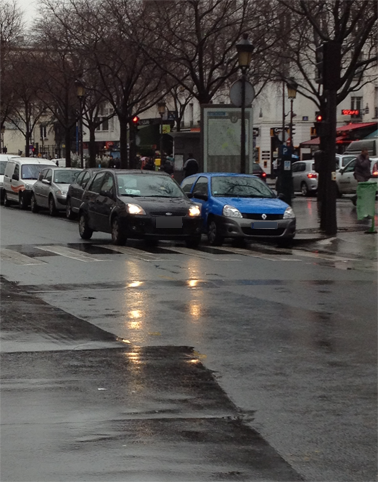 Rain in real life has a lot of impact on the appearance of the world. The goal of this series is to describe technique, both technical and artistic, to be able to render a world rainy mood. By wet world, I mean not only world under rain, but also world after it stop raining. Let’s begin this series by an observation of the real-life wet world. As always, any feedbacks or comments are welcome. The first thing I have done when I started to study this topic for my game “Remember Me” is to make a lot of references. All pictures are programmer’s photography with low camera :). I should advice that’s I focus on moderate rain in urban environment not rain forest or other heavy rain. Let’s share some result (click for high res version).